Check out this clip of the action today at the Fort! Here Chloe has the ball, and faces interference from Maggie and Truman. 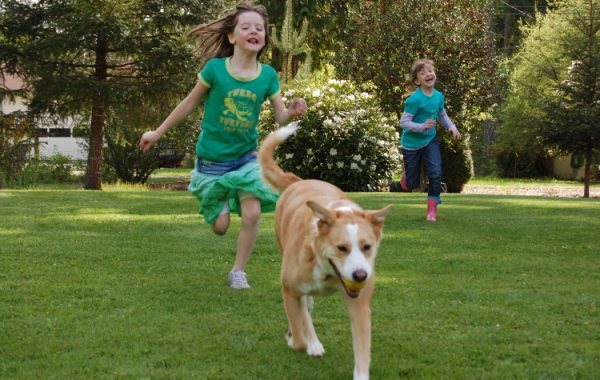 Maggie gets the ball next, and skillfully keeps it away from Gideon and Chloe! Last, but not least, we take a peek at the smaller guys who were here today. Oskar and Bruiser also got some ball time, and Oskar is just adorable when he chases it. He'll bark at the ball when it doesn't slow down, and will wait for it to bounce off of walls instead of chasing it the whole way. He's a smart guy! Enjoy your first long weekend of the summer! Remember, we are closed this coming Monday, May 31st. P.S. More doggie surf comp photos can be found here (it starts off with some Zoo photos then turns to the doggie surfing). In other news, a renegade pup has finally been captured in Cali and if you are into the "Pitbull Debate" at all this may be of interest to you. Our first two clips feature Jersey Boy, Phoenix and Keera involved in some non-stop action. Too fun! Great articles were found this morning... I emphasize staying up on this one. some clips ! ! ! Here are some wonderful clips captured today. The two clips of Cinder (a neat young Golden, fairly new to the fort) and Niko illustrate great fair and balanced play. Two new pups, no camera, doh! We had two new dogs assess this morning. Unfortunately I forgot my camera in my Fiance's car, pics will be coming later this week. 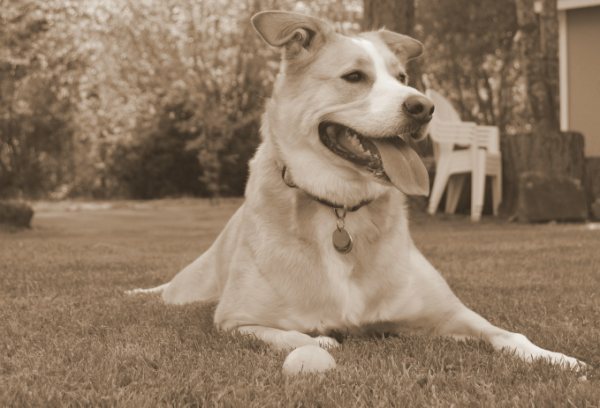 The first canine was Darby. 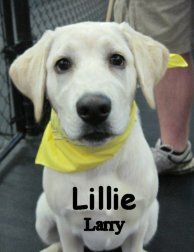 She is a seven month old, 55 pound, Golden Retriever. Darby did excellent, she started playing with members of the Medium Roll pack right off the bat! She is going to be tired after this 1/2 day. Our second assessment was Samarah. 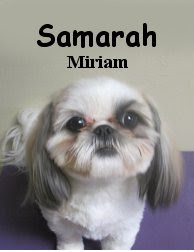 She is a one year old, 12 pound Shih Tzu. She likes to play rough (in a good way) and went for some of the rowdiest that we have upstairs in the Little Roll. Apparently some of Sami's best buddies are big bruisers. She has a Mastiff friend and a Pitbull mix buddy! Nice job Sami! Here's a clip about the Karelian Bear Dog who helped to track a bear that was on the loose in Tacoma. Karelian Bear Dogs are a type of hunting dog from Finland, where they typically hunt moose and elk. This weekend, the Seattle Kennel Club is hosting agility trials. That sounds pretty exciting-- I've only ever seen agility competitions on the Animal Planet channel! It takes a lot of training and dedication to be able to compete in agility, and I have a lot of respect for the dogs and owners who can handle it. Also this weekend is Peace Out at Merrill Gardens--the Tacoma Humane Society is going to be there with some adoptable puppies, spreading the word about some of the services that they offer to the community. They are pretty good, check them out. Here's a clip of our two Great Dane gals Athena and Bella taking advantage of "Nap Time" hahaha! Ma and Pa captured this cool clip of West Highland Terrier, Rainier, roughing up the rubber ring toy. Rainier has been coming to the fort for three years and he has a blast upstairs in the Little Roll. Toys are his absolute favorite thing, especially the new ones we try out. Today's assessment was Gideon. I won't deny it, he is a lot of dog... But you know what? He did pretty well for a big rambunctious guy! 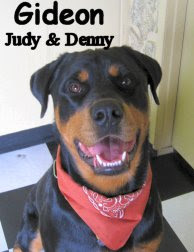 Gideon is a two year old, 110 pound, Rottweiler. He definitely passed his first day, Big Roll, debut. I bet we will be seeing more of this one. P.S. Two interesting articles here and here (I'll let you know, the latter is a sad one). Welcome Domino and a funny clip! 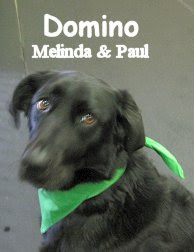 Domino is a four year old, 47 pound, Labrador Mix that was assessed this morning. She didn't play much but seemed fairly comfortable and spoke good dog. We believe Domino will be having much more fun at the fort once she gets used to it. This morning on the news they played this hilarious clip and I just had to share it! Things were pretty chill today at the Fort, but that doesn't mean that it was boring! Here's a clip of a few members of today's gang: Mimi, Niko, Kona, and Teddy. Here's a neat Tacoma-related article- the Browns Point Lighthouse Park in Northeast Tacoma is having a grand re-opening celebration tomorrow. Sounds like a lot of fun! In dog-related news, the Sydney opera house (in Sydney, Australia) is starting a concert series called "Music for Dogs" which will be in pitches so high that only dogs can hear them! Lou Reed, former Velvet Underground frontman, will be participating in the concert. Sounds like it's going to be quite a show--for our four-legged friends, at least. If you're looking for something to do out in the sunshine tomorrow, you can check out Armed Forces Day at Joint Base Lewis-McChord. It sounds like it will be pretty neat--I know that I'd love to check out the on-base Military Museum. 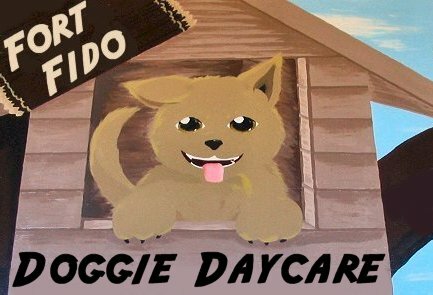 And remember, you can always bring Fido here on Saturdays! I'll wrap things up with a clip of some exciting big roll action. Kyoshi the Akita and Pawsha the Alaskan Malamute are tearing it up! Two of our German Shepherds, Jake and Hektor, have really been hitting it off lately. Good times! Our manager Hope told me about the Pet Palooza event that is happening in Auburn on May 22nd. She heard about it on the radio, sounds like it's going to be a big fun filled event! Cool clip and a funny link! In this clip we have new Fort Fido friend Zoey having a blast with Romeo. Dakota's mom Michelle sent us in some wonderful pictures of Dakota playing with her family. Dakota has been coming to Fort Fido since we opened. Thank you Michelle for the great photos and your continuous support! I found this early last week and saved it for a rainy day... This is too funny! I give you, Dogs gone wild! Happy late Mother's Day, let us get back to the dry weather for a bit! 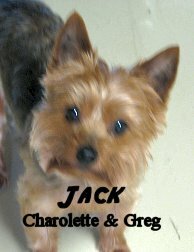 We had three Yorkies come in today! Jack and Jill have come in the past, but for 9 month old Verdel, today was his very first time. 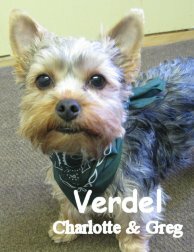 Verdel was a little nervous about being away from home, but he seemed open to socializing.The three siblings rolled around together for a bit, before Jack broke off to go play a little with Charlie, a Bichon. Welcome Basli and Zoey ! ! We had two more assessments early this morning. 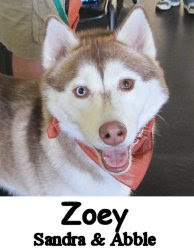 Our second assessment was Zoey. She is a beautiful, two year old, 45 pound, Red Siberian Husky. Zoey took to the pack quickly, having a blast in the Medium Roll. Have a nice weekend (fingers crossed for sun)! P.S. I found two neat articles this morning too, check 'em out! 1 & 2. Super busy today... Just gonna show the pics :) ! Lillie is a baby Yellow Lab and Suki is a Jack Russel Terrier. Both are fitting in well, score two for our side! Real feel good ones too! This one was the most interesting to me. This was Charlotte's first full day upstairs, we are happy that she is doing well. 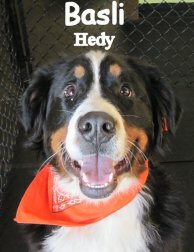 I decided to search in the internet for interesting dog news this morning, and I found this uplifting story. It is about a program called "Pets for Vets" which matches shelter dogs with veterans who could benefit from having a loving and dedicated companion. If you want to read more stories about dogs that they have placed, check out their website, www.pets-for-vets.com. 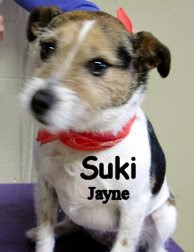 Here's another good one about helping shelter dogs get adopted, this time locally. 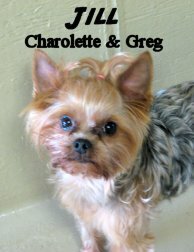 Carolyn Craft, a real estate agent with Windermere, has been helping to promote the Tacoma/Pierce County Animal Shelter's "Adoptable Pet of the Week." 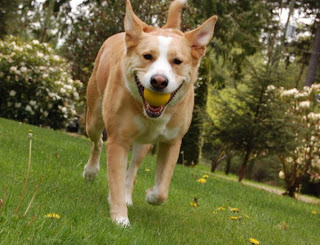 One last tidbit of news: A group in Bonney Lake was just granted a one year trial lease to begin operating an off-leash dog park at Viking Park. You can follow Updates and get involved by checking out at their website. One last link, and this time to us! The next training class and seminar have been scheduled. The "Balanced and Calm" seminar is going to be Sunday August 1st from 11am-12:30pm. The next round of Basic Obedience is going to be June 29th to July 15th, Tuesdays and Thursdays from 7:15pm-8:15pm. Dogs do not have to be Fort Fido members to attend, they just need to show that they are up to date on their shots. If you have friends with dogs, be sure to point us out!